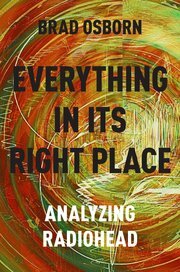 Oxford University Press is thrilled to announce the publication of Analyzing Radiohead: Everything in its Right Place, by University of Kansas Assistant Professor of Music Theory Brad Osborn, Ph.D. Expanding on recent work in musical perception, focusing particularly on form, rhythm and meter, timbre, and harmony, Everything in its Right Place treats Radiohead’s recordings as rich sonic ecosystems in which a listener participates in an individual search for meaning, bringing along expectations learned from popular music, classical music, or even Radiohead’s own compositional idiolect. Synthesizing insights from a range of new methodologies in the theory of pop and rock, and specifically designed for integration into music theory courses for upper level undergraduates, Everything in its Right Place is sure to find wide readership among scholars and students, as well as avid listeners who seek a deeper understanding of Radiohead’s distinctive juxtapositional style. Order now and save 30%! Enter promo code AAFLYG6 at checkout at OUP.com. This entry was posted in New publications, News by IASPM webmaster. Bookmark the permalink.